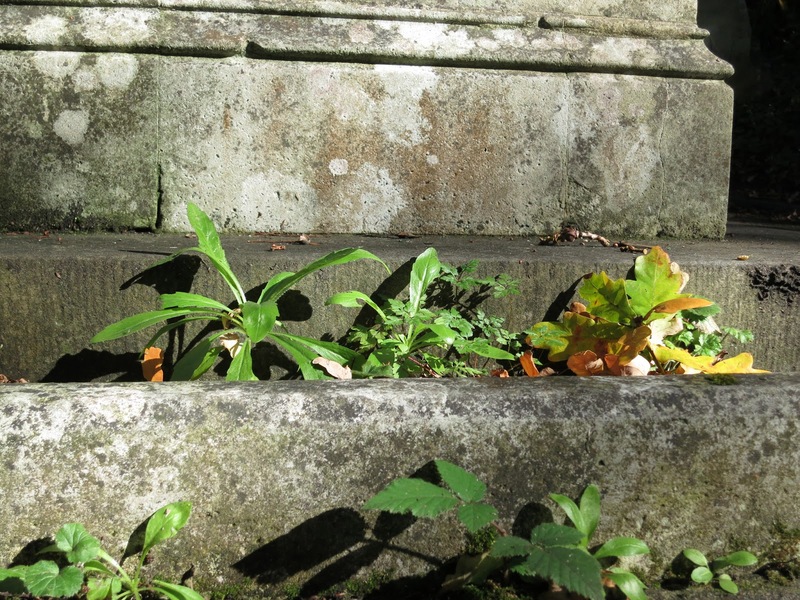 As part of my 'wild plants that grow in cities' project I recently visited an urban Churchyard. When I was younger, I used confidence as a power shield. I wasn't stupid enough to imagine this made me invincible but it worked pretty well. Hanging in my cupboard over the years, un-needed, underused, it's grown threadbare and moth-eaten. But that day I suddenly felt I could do with it again for when I went through the gate I realised the wooded area behind the Church was full of raised voices. I faltered. It was a good guess, I reckoned, that there would be bodies attached to the voices and they might not be friendly bodies. I'm not a linguist but the voices sounded Polish. There are a lot of Poles in England nowadays. All the dentists at my local practice are Poles and every one of them has been a darned site better at dentistry than any dentist I've had before. They seem to be remarkably adept at treatment without pain. None the less, however good Polish dental schools are it seemed unlikely that these graveyard woods would be full of Polish dentists haranguing each other so, as I said, I faltered. All I could think of was that these were migrants who hadn't found work and had set up an encampment. Would they be happy to have an English blogger wandering through their dispute? I never found out. For all the time I was there loud voices floated from among the trees but I never approached and they didn't emerge to approach me. I stood for a moment, should I walk forward? It was the third Churchyard I'd tried in an hour. The others hadn't had graveyards - just tarmac, gravel and well tended flower beds. So I gathered up the tatters of my shredded confidence, drew them round me - and walked on. Within a few steps, I was, once again, disconcerted. 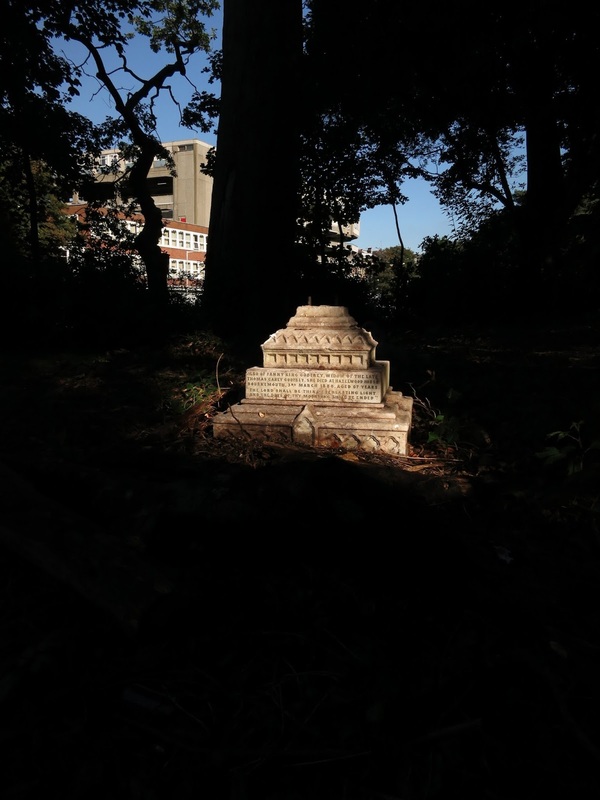 A young couple rose from a grassy area between graves. They seemed to be pulling on their real clothes as firmly as I was tugging at my invisible protection. Forward still? Yes. Why not? I slid my eyes aside and walked purposefully up the slope. Steps. A tomb. Plants growing along the plinth. Great! I took my pictures, thanked them (after all, I had intruded on their space) and went back down towards the gate. Should I leave? No! Skirting the voices among the trees, I found bittersweet (Woody Nightshade) on the edge of the wood. 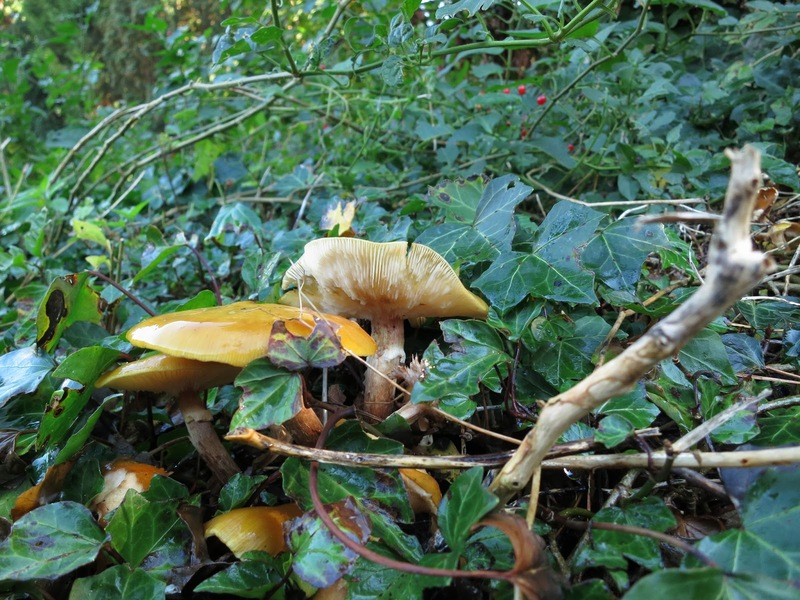 and more fungi. These yellow ones were several inches across. I didn't touch them to find out if they are merely shiny or slimy too. I'm not going to attempt IDs. But . 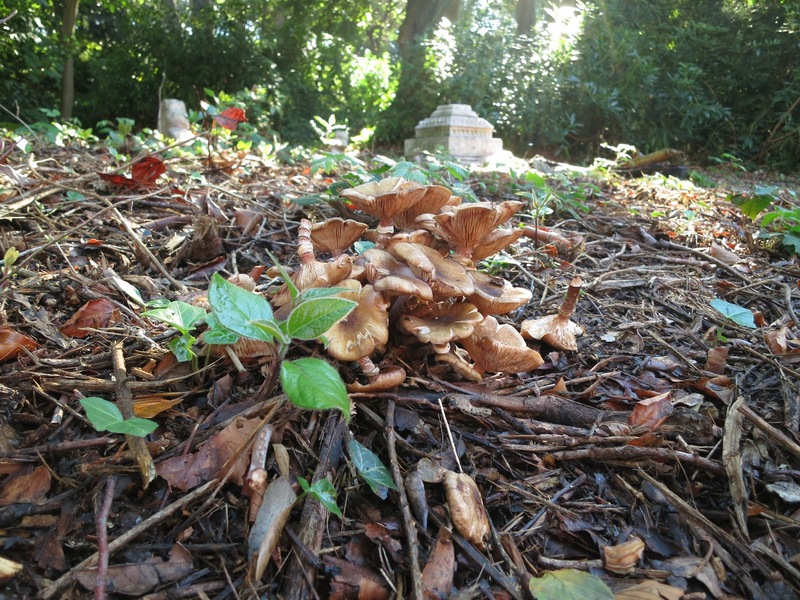 . . after photographing more graves and ivy and a sweet chestnut shell . . . I hurried away for the train back home - full of puzzles, pictures and a cheerful sense that, with a little bit of work - a stitch here, a patch there - my old and tattered cloak of (almost) invincibility could possibly be worn once again with pride. well done you are braver than I would be in that situation! Sounds like quite an adventure:) I usually find that most people of whatever nationality are OK with you if you're OK with them. 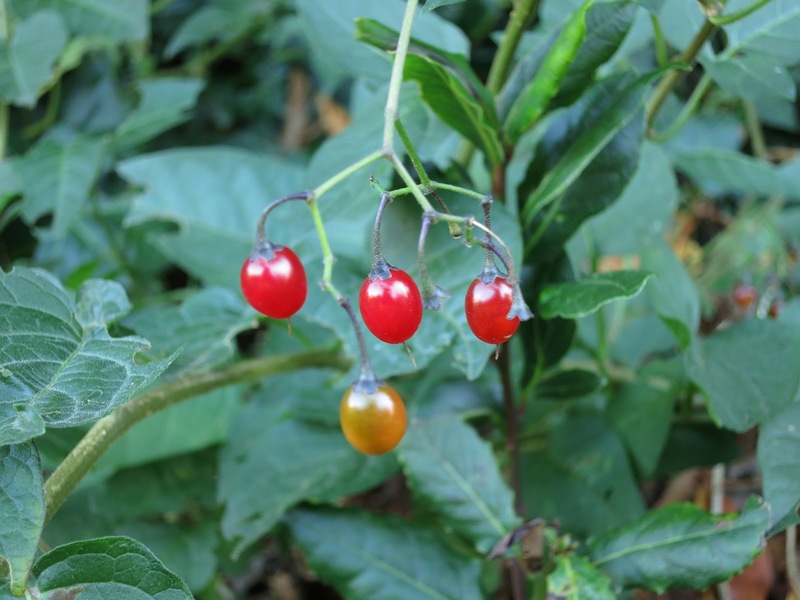 Love the photos of the fungus and woody nightshade - they're my favourite wold berries. Hello Lyn. I don't like the idea of confidence slipping with age. Maybe my task as time goes by will be to learn to grow old gracefully. That will be a challenge! Hello Rowan. People of all nationalities are fine in the right circumstances but this all felt very strange. I would have felt relaxed if the voices had been happily singing . . . I never knew graveyards were such busy places. I'm glad you didn't give despite so many distractions to show us the treasures you found. Braver than I. My confidence has got up and gone. And I love that you are looking for woodland-style plants in the city. The very idea is wonderful. I find my confidence ebbs and flows with no discernable pattern, other than that it is always lower when I am tired. 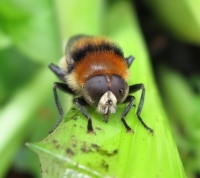 Glad you persevered, or we wouldn't have seen the fungi. You make me want to return to the graveyard on the headland to explore what might be growing there. 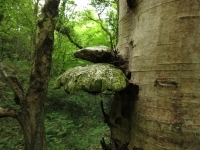 Great fungi photos! Always best not to touch just in case. Some are so incredibly toxic! I just got a big ID book out of the library, but whether I get time to get some identification practice in, is another matter! What a lovely post. Good for you getting out there and exploring solo. Churchyards are so wonderful in urban settings. One of London's Big Seven (or is it Six?) graveyards is nearby and has become a park over the years. We used to love going there when it was wilder, and hid drinkers and all sorts of secret goings on. Now it has been tamed and is used much more. I miss the wildness, but I guess that more people are getting pleasure from the space - and of course plant life is still there, if a little diminished. Great blog post - wish I had written that one! I spent lots of time in the village churchyard as a child but would be too lacking in invincibility now. An interesting journey...love graveyards but mostly the empty, quiet ones. I like to go to old graveyards also, but there aren't very many old ones around here. I don't think I've actually had a conversation with anyone there.